Even a complete lack of wind and racing couldn't dampen the spirits of the Half Ton sailors on the final day of the 2011 Half Ton Classic Cup supported by South Boats. While they waited in vain for the wind to fill in they found other ways to entertain themselves including water fights, some dastardly piracy and crew kidnapping with ransom demands (the victim assures us she was very well treated by her captors), and even a beer race with the first boat to propel itself without engine to Half Ton Class Chairman Bert Jansen aboard Envol winning a case of Belgian beer. Whilst there was disappointment at losing the two final races it was clear that all felt their Champions were worthy winners and at the prize giving Hampshire's Michael Kershaw and the crew of Chimp received a rousing reception as they claimed the trophy. Helmed by Ireland's George Kenefick the crew also included Graeme Love, Ian Brown, Roger Merino and Ed Fitzgerald. Speaking after racing Michael Kershaw was both thrilled and a little surprised to find himself holding the trophy noting that his crew selection came about as much through luck as judgement and that they had never sailed together as a crew before the first race of the championship. He praised the outstanding quality of the competition and thanked the members and staff of the Royal Corinthian Yacht Club, Race Officer Rob Lamb and his team, the Half Ton Class and Richard and Ursula Hollis who led the Regatta Committee for what he described as a fantastic marker event for the class with so many boats. Certainly 38 boats is possibly the biggest gathering of Half Tonners ever, including the Half Ton Cups of the class' heyday in the 1980s. Completing the podium line up were defending champion Philippe Pilate's French team aboard General Tapioca, a 1978 Berret, and Concorde, the 1989 Gautier design, owned by Francis Marshall from Cornwall. The battle for third between Concorde, Tim and David Cunliffe's Insatiable and Robbie Tregear's Per Eilsa had been fierce and Francis Marshall was thrilled to receive his third prize having beaten both boats by just 1.7 points. Insatiable claimed fourth on count-back with Per Elisa fifth. In the Production Boat Division the winner was Francois Michelin's Chani, one of Ron Holland's wonderful Golden Shamrocks. In second place was the SJ32 Fletcher Lynd, owned by Fredric Denis, and Michael Langhan's Albin Ballad Strolch came third. There were also plenty of humorous prizes including a bucket and spade for Sibelius which went aground on Ryde Sands, a No Parking sign for Red Cloud which took up temporary residence on one of the marks, and a Best Party Games book for Hullabaloo XV who were the last the leave the bar every night! Special prizes were also awarded to General Tapioca, Ian Van Burn's Fantasy and Toni Stuschek and Janne Tulokas' Blues in recognition of having competed in all five editions of the revival Half Ton Classic Cup. Arguably one of the most important prizes of the entire event is the Half Ton True Spirit Trophy, which is awarded not to the winning team, but to the team that best represents the true spirit of camaraderie and competition in the Half Ton Classic Class. 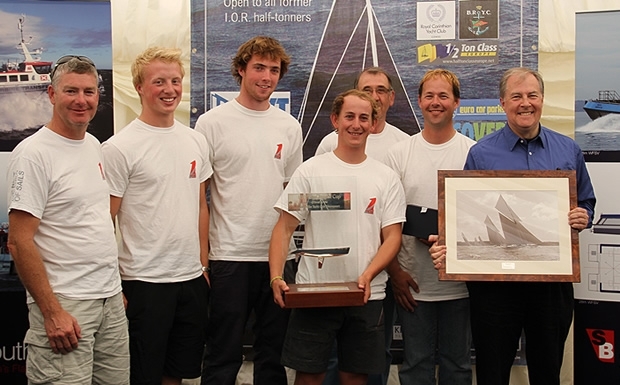 The members of the fleet elect the winner and by a massive number of votes the 2011 recipient was confirmed as Jean-Benoit Boels' Envol crewed by Diego Boels, Lionel Coquelet, Bert Jansen, Olivier Michel, Adrien Michele and Tom Jansen. At 11 years old Tom Jansen was also the youngest competitor and it was a lovely sight to see him proudly holding aloft the keeper prize, a unique canvas printed photograph by local photographer Hamo Thornycroft. Class Chairman Bert Jansen concluded proceedings by once again thanking the 38 teams from seven nations for making the trip to Cowes and invited them to join him for the 2013 edition of the Half Ton Classic Cup, which will be held in France at a venue to be confirmed.